What is MAKING FANTASTIC SHORT FILMS? 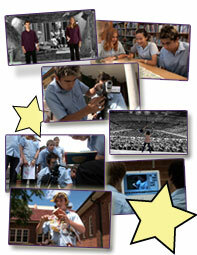 MFSF is an educational resource for primary and secondary schools (for kids aged 10-18). It's designed to be run as a 5-week course in one class period, but can be adjusted to meet the teacher's needs. Click here for more info. What technology do we need? All that's required is a video camera (which can be borrowed) and a computer running video editing software (which can even be the free software included with your operating system -- i.e., Windows MovieMaker or Mac iMovie). The camera and computer should have a firewire connection for capturing the video. Click here for more info. What is the MFSF video format? Orders placed in Australia and New Zealand receive the 70-minute standard-definition PAL DVD from footage created in high-definition. Orders placed in the USA receive the NTSC version. As the production was shot in high-definition, we anticipate an HD-DVD version soon. Please enquire for more details, and to register your interest. What's included with the printed material? The printed material is divided into 3 sections. First is the Lesson Guide & Teacher Notes section, which offers a complete step-by-step five-week course. The material is designed to be simple enough for a teacher who knows nothing about film or filmmaking, and detailed enough for teachers with some experience. Next are the Student Handouts, which will be used at the end of each class. These are designed to encourage students' interactive participation. And lastly is the Answer Guide, providing the answers to all the handouts. You can literally follow step-by-step, or you can add, cut, or modify sections to suit the needs of your class. Does it meet curriculum requirements? MFSF was designed to meet the curriculum requirements of New South Wales, Australia's Year 7 English classes, whilst being broad enough to satisfy many other needs. It also meets curriculum requirements for English, Media Studies, and/or Drama in each of the Australian states, as well as in New Zealand, and can be adapted to meet other specific requirements. In the USA, it meets several curriculum requirements in each of the 50 states. How can it be used in other subject areas? Perhaps the most powerful use of MFSF is as an educational tool for subject areas completely outside the realm of filmmaking. By using MFSF as a teaching tool for any subject area (such as History, Science, or Foreign Languages, for example), teachers give their students an exciting, fun, interactive, dynamic and tactile way to learn new information. See the How to Use It page for more information. What's the fastest way to get MFSF? If you're in Australia, the fastest way is to order online. Your order ships the next business day. If you're in New Zealand, the quickest option is direct deposit -- your order ships the day after payment is confirmed. If you're in the USA, please see the Pre-Order page. Can you provide an invoice prior to our order? Yes. If your school needs an invoice before it's authorised to issue payment, simply contact us with the details of the order, and we'll create an invoice for you. Post it with payment or pay online, and we'll ship immediately. What if our school uses Purchase Orders? Yes, within Australia and New Zealand. We accept Purchase Orders on 30-day terms from any government accredited school in Australia or New Zealand. Simply fax us your Purchase Order. We'll ship it with the invoice on confirmation, generally the next day. The invoice is due within 30 calendar days. For schools outside Australia and New Zealand, we are not yet able to take purchase orders. Plans for doing so are currently being designed. Who do we make cheques payable to? Can MFSF be purchased for home use? Yes, anyone can get and use MFSF. But to better serve home users, we're putting together a DVD for use at home. Click here for more info. Can we order this for somebody else? Yes. If you want to get a copy for a school, we call it "sponsoring", and you'll find more information here, or in the next section of this FAQ. If you want to purchase a copy for a friend, for your child, or for an aspiring filmmaker you know, naturally, you're more than welcome to do so. What is sponsoring and why would I do it? MFSF is an important and vital resource for schools. We firmly believe every school should have at least one copy, because kids need (and love) the language of film, and using it as a medium of communication. Unfortunately, many smaller schools (and even some larger ones) don't have the resources to purchase a copy. By sponsoring a school, a parent, business, or teacher's friend can help a school provide these valuable skills to enthusiastic students. What if the school I want to sponsor already owns a copy? When you sponsor a school, we look at whether that school has a sufficient number of copies for the number of students enrolled. If not, we will send your sponsored copy to the school of your choice. If your school already has its copies (none do yet), we will send your sponsored copy to a smaller school or one without the financial resources to purchase a copy. As a sponsor, what do I get? You'll get a tax invoice posted to you for tax purposes, but we'll also include a special cover letter and additional "certificate" page with the MFSF resource, which will be included in the front of the resource. It will include your name, and the name of the school you've sponsored. We've been advised that sponsoring a school should be tax deductible in most situations. We can't provide tax or legal advice however, and you should always consult with your accountant if this is the deciding factor. Our school would like to be sponsored. Can you add us to a list? If your school would like to own MFSF but doesn't have the resources, our first suggestion is to mention MFSF (or perhaps the Fantasticoff Film Festival!) in your school newsletter and/or contact the parents of your students with a "wishlist" request. In other words, why not simply ask them to buy it for you? You might also consider a fundraiser or getting parents to "chip in" for a copy. We've kept the price of MFSF very low, so it shouldn't be hard to get yours. In the meantime, feel free to send your school name (with contact details) to mfsf@embryo-films.com with the subject "ADD TO SPONSOR LIST", and we'll add your school. We can't guarantee we'll find you a sponsor, but it can't hurt. FANTASTICOFF is a new online film festival designed to encourage schools to use short film making as a learning tool, and to promote filmmaking to kids as a powerful communication tool. More information can be found on the fantasticoff.com website. Does our school need to purchase MFSF to enter? No. But all proceeds from the sales of MFSF go to support FANTASTICOFF, so when you order copies of MFSF for your school, you're directly helping us build and sustain the festival. Entries will be accepted from any school in Australia or New Zealand, or the student of any school, whether or not they own a copy of MFSF. More details can be found on the fantasticoff.com website. When is FANTASTICOFF expected to begin? We're currently looking for corporate sponsors, to keep FANTASTICOFF free to the schools and student filmmakers. Once we've got that sorted, full details will go online. You can help! Let corporate sponsors know about us, if you've got access to them, or if you want to help directly, contact us today! More details will be posted online as they come available! If you have a question we haven't answered in this FAQ, feel free to email us on mfsf@embryo-films.com with the subject "FAQ Question", and we'll reply personally by email, and add your question to the list. Contact us today!